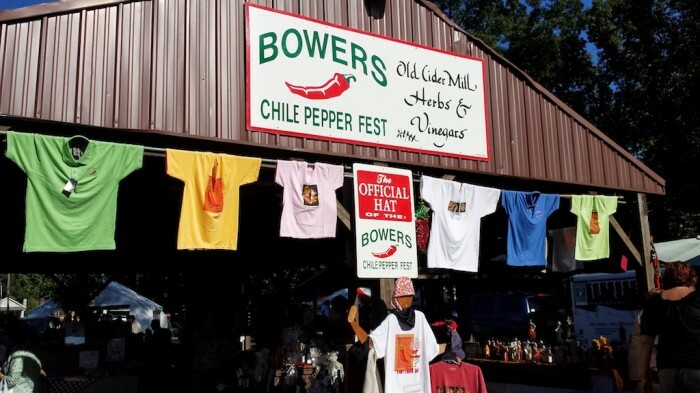 Bowers Chile Pepper Festival is our favorite East Coast event. Nestled in a beautiful park, it ranks among the most prolific and successful chilehead gatherings of all. Midway between Reading and Allentown PA, and just outside of the college town of Kutztown, the Bowers Chile Pepper Festival is second to none. Featuring a nearby farm with acres of fresh chile peppers that are yours for the picking, there is a small wooded park just full of hot sauce makers plying their hot sauce creations to light you up and bring you joy. Here is a video I shot in the hopes of bringing you a “taste” of what this festival is all about. It was shot with an iPhone 4s mounted on a hand-held Steadicam device. The concept was to take you thru the Bowers Chile Pepper Festival (a two day event) in about 10 minutes. I’m not the greatest video editor in the world, but I had fun playing with it, and I hope you enjoy it. We also posted some nice pics of the Bowers Chile Pepper Festival here. Hopefully, you can make it to Bowers PA next year for the festival. It really is the best, and all the vendors swear that they sell tons of product at this event. Next to the NYC Hot Sauce Expo, which had its debut last year, this may make up the two most popular and attended events on the East Coast. And if you’ve ever been to Bowers, please leave a Comment below and tell us. Excellent video, bro!!!!!! Bowers is such an incredible event!!!!!! Thanks, Tom! Marilyn had a blast helping Diane in your booth. No Tom, you and Diane are the BEST!! I have a Reaper sauce in the making! It’s f-ing killer!!!!!!!!!!!!! That sounds scary good Tom.